Perhaps the closest we will ever get to a movie version of Kirov will be a professional audio book project, and this is now on the radar screen. 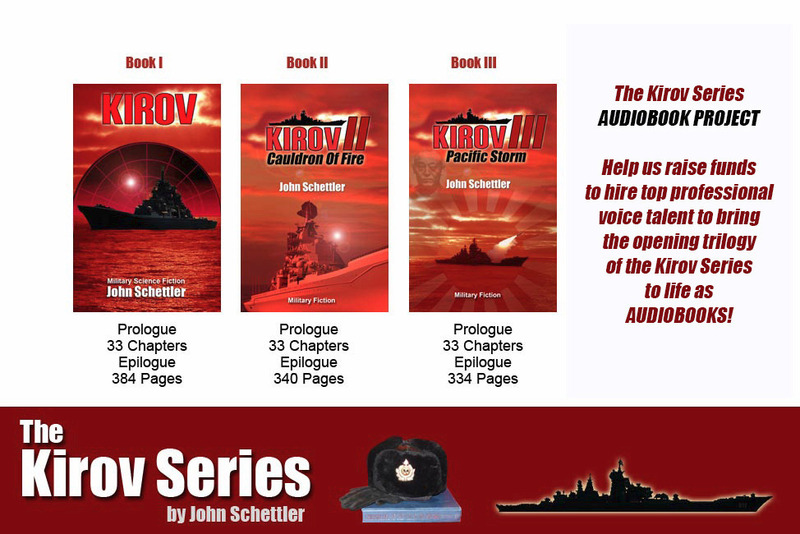 The expense required to do it right, hiring enough voice talent to bring the characters to life, has prompted us to see if readers might support this project through a “Go Fund Me” campaign to offer the first three volumes of the Kirov Series as audio books. We’re trying to raise $25,000 to do this, and here are the different levels where you can contribute to help make the project a reality. Support us at the $20 level as a way to say “Thanks” to the author for delivering 40 volumes of this incredible series with such dedication, and also get a sales code that will deliver a free kindle version of a coming book from the final season of the series. Support us at the $50 level and receive any single volume of the Kirov Series you designate as a book, personally autographed by the author. Support us at the $100 level and receive a free copy of one finished audiobook in either digital or CD format, and an autographed copy of that same novel in book form. Support us at the $200 level and receive the opening trilogy of the Series as finished audio books when complete, including all three autographed paperbacks. Support us at the $500 level and receive all three audiobooks as above and also any single 8 volume season of the Kirov Series as paperbacks signed by the author. Support us at the $1000 level and receive all three audiobooks and also the entire first 40 volumes of the Kirov Series, with each one autographed by the author. With enduring thanks to all my many readers who stayed with this incredible saga through 40 long volumes. There's more to come! Here's your chance to give the author something back, and help to create three great audio books to launch the series in a new and different way.